I was just talking to myself this morning, “Self…” “Huh? What is it? Who said that?” Must be the time of year, don’t you reckon? Hell, it was only me. I was wondering whether there might be any famous ‘hauntings’ around Piedmont. This is the time of year for that kind of thing so I sat and cogitated on it. Soon the wondrous meanderings of my mind became even more wondrously jammed than usual. I reckon you could call it mental constipation, because certainly nothing was moving up there. A rare flash of intuition led me to the internet. An hour or more passed before I conceded that the internet wasn’t going to come up with anything either. But I did see some great pictures of Hank Williams’ death car, and a two-headed alligator, and Noccalula Falls. It occurred to me that some of my gentle readers, maybe even all three of them, may never have heard the story of Princess Noccalula and I’m going to remedy that here and now. 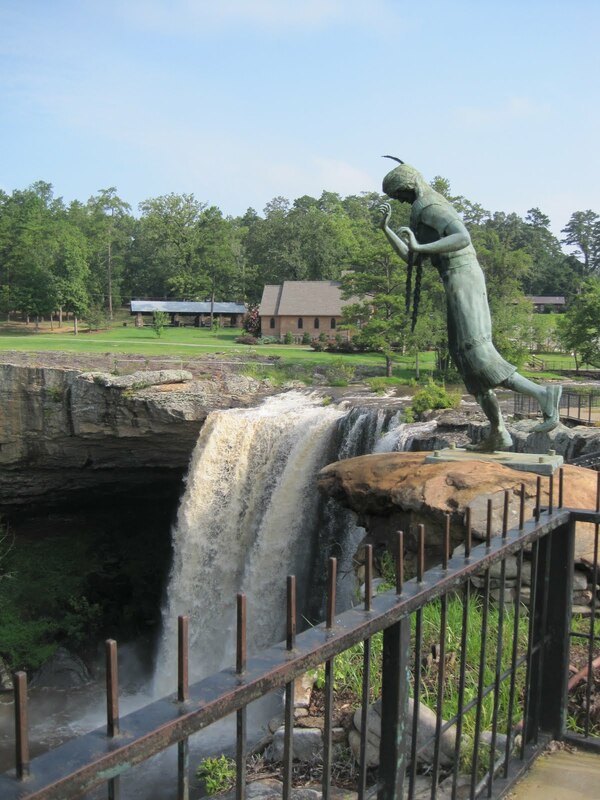 Now, over the years there’ve been quite a few retellings of the legend of Noccalula. One goes back to the late 1700s, but the one that has gotten the most currency is the one Mathilde Bilbro, a white composer, popularized in the early 1900s. Way back, years and years ago on a mountaintop within sight and sound of the great waterfall of the Black Creek river lived the great Indian Chief, Attakullakulla, whose young daughter was famous for her beauty and the loveliness of her character. Many of the gallant braves approached the old Chief, seeking the hand of Noccalula. There was only one who was acceptable to Chief Attakullakulla; the rich and powerful Creek Chief Ortus Micco who had much land, horses, and blankets to exchange. Noccalula was desperately in love with the great Pathkiller and hoped to marry him and raise a large family beside the river. Her father though, was adamant. You will be married to Ortus Micco and there’s an end to it! Poor Noccalula was heartbroken and became despondent when the Chief told her Pathkiller had been driven from the village and forbidden to return. At last, the day of the wedding feast came. All the village and many people from Ortus Micco’s village were present. The smell of roasting meats rose on the early morning air, carried by a gentle breeze. The sounds of laughter and gaiety could be heard over the sound of the great waterfall. Noccalula allowed herself to be dressed in the beautiful, colorful wedding robes, but she couldn’t manage a smile. Within her bosom, the heart so filled with love for handsome Pathkiller had been shattered by her father’s strong will. How could her father sell her to a stranger from a strange tribe for a few horses and blankets and deprive her of the one man she would love as long as she lived? The music and dancing grew louder and more boisterous. 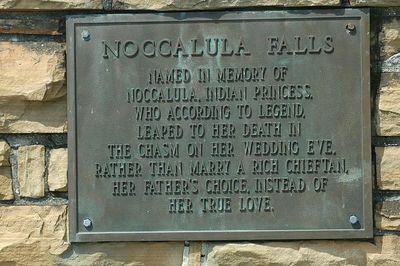 Overcome with grief, Noccalula quietly slipped away from the festivities. The rhythmic rush of the water called out to her. For a moment, she stared down into the chasm. One leap. That’s all she needed to be out of her troubles. One leap and she could sleep and wake with the ancestors. The wind pushed her braids back as a gentle smile appeared on the beautiful girl’s face. She was barely conscious of the cold water as it embraced her and took her to the bottom. Chief Attakullakulla was heartbroken and beyond comfort as he realized that he, himself had pushed his beloved daughter into the dark waters under the waterfall. 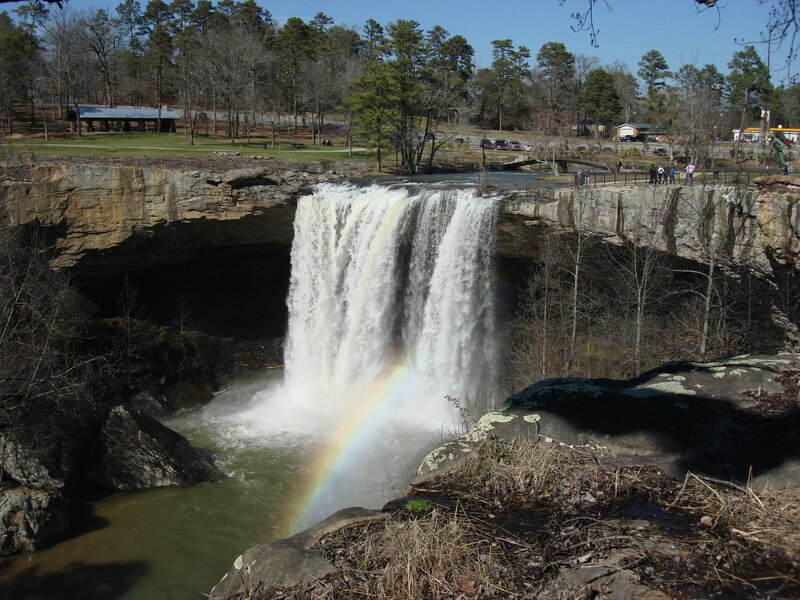 Her lifeless body was retrieved from the water and buried underneath the falls and from that day until this it has been called Noccalula Falls. My quest for haints in Piedmont didn’t turn up anything, but at least you got the makings of a Harlequin romance novel. Now, somebody somewhere around Piedmont must know a good ghost story or two. The only one I really know is about my Aunt Margie and it’s not that much of a story, come to think of it. Share yours with me, won’t you? This entry was posted in Random Musings, Wright Tales and tagged Alabama, Fiction, northeast alabama, random thoughts, writing. Bookmark the permalink.